Being Jewish, I don't actually celebrate Christmas, but I believe that the holiday spirit is something that can be enjoyed by all. When I was given the opportunity to review the book "Christmas From Heaven," I jumped at the chance, because not only is it a true story, but it shows how the kindness of one person can affect such a great number of people. It really exemplifies this spirit. 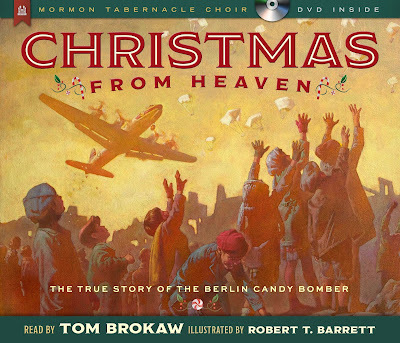 "Christmas From Heaven," written by Tom Brokaw, is a book about Lt. Gail Halvorsen, also known as the Berlin Candy Bomber. This man can be classified as a true angel on earth. I so enjoyed reading this book about the candy "bombs" he dropped in post-WWII Berlin. The illustrations by Robert T. Barrett really captured the sentiment and appear to have been made from photos taken of the lieutenant and the children of Berlin, though I have no idea if they really were. Interspersed through the book are actual photos of the cargo planes and the candy parachutes. I know my kids are going to love this book, and I hope it will teach them that there are people in this world who can't afford to eat candy and that sharing with them brings such light to their lives. At the end of the book are instructions on how to make your own candy parachutes, and I really want to do this with my kids. The only question is how to drop them on people without getting into trouble... 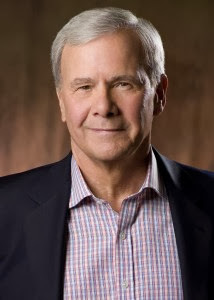 There's also an enclosed DVD of Tom Brokaw with the Mormon Tabernacle Choir. Lt. Halvorsen, now Col. Halvorsen, is a member of the Church of Jesus Christ of Latter-day Saints, so it is quite appropriate to have a DVD of a live performance of Brokaw and the choir included. I spent last Christmas and New Year's with a community of Mormons, and I'll be going back after New Year's to visit them again. I cannot wait to share this book and DVD with them. I was also sent the Biblical Names of Christ Ornament Set. 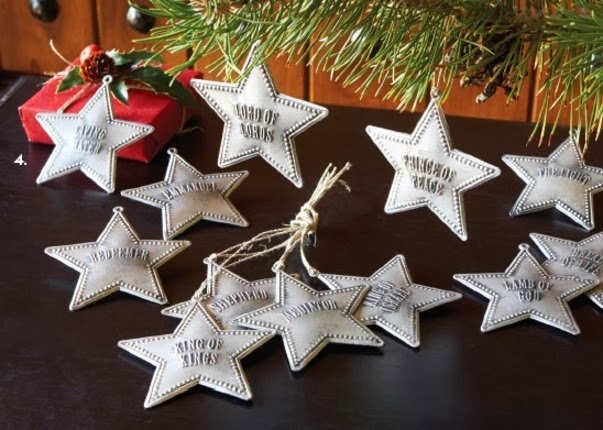 The beautiful silver-colored stars would look fabulous on any Christmas tree, and I plan to send them to my Mormon friends. Hopefully they won't have already taken their tree down by the time I get there, because I really want to see how they look! I knew some of these names - mostly from having heard Handel's Messiah performed a hundred times as a child - but others I wasn't so familiar with. There are 12 ornaments, so you could even use them with a 12 days of Christmas theme. You can buy "Christmas From Heaven" for $19.79 + shipping. You can buy the Biblical Names of Christ Ornament Set for $14.95 + shipping. We were sent "Christmas From Heaven" and the Biblical Names of Christ Ornament Set free of charge for the sole purpose of this review; no other compensation was received. All opinions expressed are my own.